Most of the leaves have fallen like stars now, their caramel and maple scents replaced with an alchemy of wood smoke and Arctic air. In the last day or so, snow has fallen like icing sugar upon the local mountains and the winter festivals have woken up from their year long slumber. A recent walk down to the ocean on a trail murmuring with magic gifted me with rare stillness, slowing down racing thoughts, the quiet broken briefly by a lone eagle’s call. Just steps away, the water lay calm in winter colours of icy blue and burnished silver. A beautiful black and white malamute with eyes of unearthly blue stood upon wet rock near its master, posing for pictures beside the seawall, his wildness shimmering beneath domestic illusion. Other delights to admire were the driftwood sculptures and seaweed mandala designs left upon the sand by the receding King tides, having returned some of the logs taken from the beaches only a day or so ago! Days like this, deeply felt, are even more precious since my father’s passing. He lived below our suite, just a short flight of stairs away – even now, I find myself peeking out our windows searching for the warm light that let us know that all was well. His rooms are empty now with someone new poised to move in, a reminder that life is never static. Change is indeed afoot, a development sign has sprung up like a poison mushroom on our street announcing a 19 storey new build to replace a nostalgic three-storey providing housing and hotel apartment suites for rent. We enjoyed the simple amenities on offer there when Terry’s sister came out for a long stay holiday a few years ago. I have fond memories of delicious meals eaten together at the dining room table before retiring to the comfortable couches, the coffee table holding glasses of red wine and bowls of salty potato chips. Those rooms offered us respite after busy days exploring the city, the thought of them and the beautiful garden being replaced by glass-like progress saddens my heart. 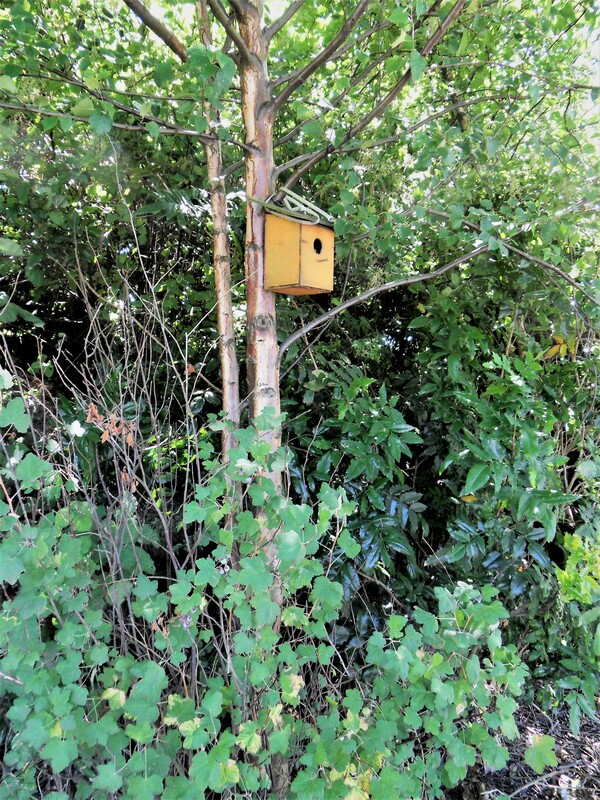 It sets a dangerous precedent for our bucolic neighbourhood tucked away from the fray. Hoarding moments and experiences like the squirrels scurrying among fallen nuts and seeds, I watch as autumn’s bright flame makes way for winter’s long shadow, counting down the days to this year’s bittersweet end. Finding more beautiful lights to see at Bright Nights in Stanley Park (Vancouver, B.C.) on a hidden inner trail! After wandering through Bright Nights, we found ourselves at Beaver Lake in Stanley Park (Vancouver, B.C.) listening to ravens and admiring the wildlife just a breath away from busy downtown. On a rare downtown visit as the summer season waned, I found myself sitting on the Vancouver Art Gallery Cafe’s terrace after a tasty lunch eaten underneath huge patio umbrellas listening to soothing classical music. 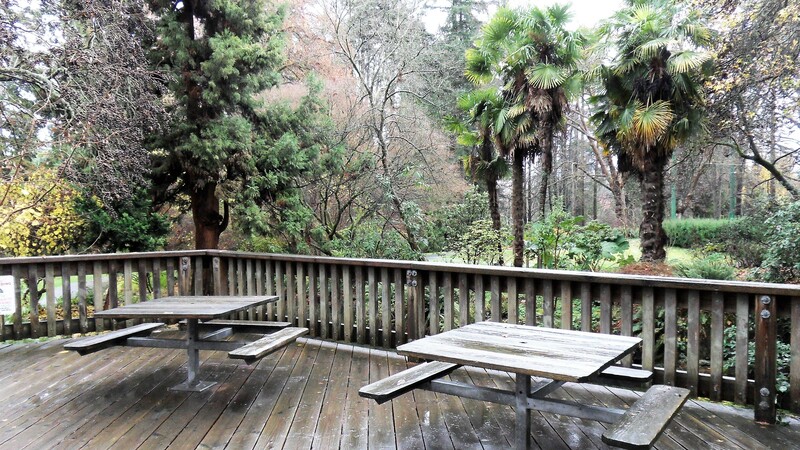 We had a refreshing rain that morning and the lush foliage still glittered in the pale sunshine as we ate. With the warm air, jewel-like hummingbirds and noisy starlings flitting about, it was the perfect setting for writing a line or two before heading to two free art exhibits still sitting on my summer wish list, fast becoming an autumn list. The first exhibit called Appearances was at the nearby Pendulum Gallery showing the work of a talented artist (Jianjun An) capturing the immigrant experience by weaving the symbol of a white mask into each painting. When I first observed the paintings I did not notice the masks but on closer inspection, I was delighted to see parts of people’s masks peeking out from bags, blending in with one woman’s careful makeup or casually tucked into clothing – the only painting without an obvious mask was the larger than life laughing face of a grandfather lifting a happy child up in front of his face (a keen observation made by a fellow patron). After a wonderful interlude, I made my way home to pop into the Listel Hotel to wander through the Sculpture Gallery East to feast my eyes on a collection of edgy photographs that caught my eye ending what turned out to be a rather inspiring day of art appreciation! Another exhibit on my wish list was to check out Cabin Fever at the Vancouver Art Gallery on one of the Tuesday night admission by donation days, I recently made time to walk through the various rooms housing life-size structures smelling of freshly painted wood with cut-outs representing windows where photographs of peaceful forest scenes projected on darkened walls made me feel for a moment that I was on a fall getaway. It was a joy to look at old books under glass, classics written by the likes of Thoreau and Kerouac as well as mythical copies of Popular Mechanics and Whole Earth Catalogues enticing us from city pursuits. As I continued to walk through the exhibit, my eyes taking in the many photographs and architectural models of cabins from here up in Whistler, down to California and across Canada to Ontario – my travels to these very same places made it feel like I was re-visiting old friends. Walking home with a beautiful sunset smudging a still blue sky, I reveled in the evening of culture I left behind, ever thankful for the donation days allowing those of us living on simple budgets to enjoy some much needed cultural space here in our busy city. As I neared my mother’s downtown apartment building, I saw her neighbour Sarah who quickly invited me up to her own creative space to see her current art in progress, decorating the lovely wooden wine boxes that previously housed this year’s Bordeaux offerings that the public can pick up at the front entrance to any local liquor store. A call to my Mom inviting her down and a nice cold beer added a delicious note to the evening. I’m diving deep as the lushness of summer gives way to the mosaic that is autumn, there are windblown and rain-drenched leaves creating a colourful abstract on the sidewalks now and the waning light is beginning to lead us into twilight much earlier as we draw our blinds against oncoming night at hours that only weeks ago found us exulting in the sun’s warm embrace. 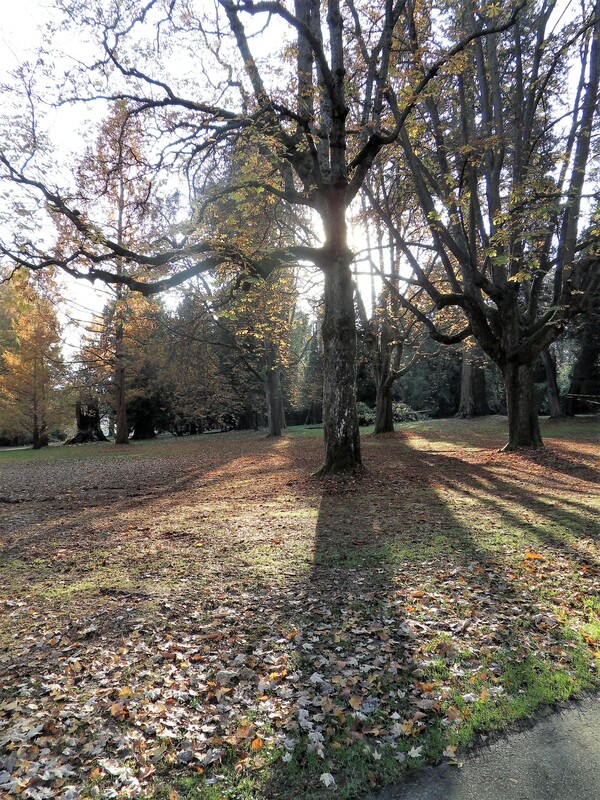 Nature’s vocation is to send light into our hearts, too – this magical shot was taken in Stanley Park (Vancouver, B.C.). 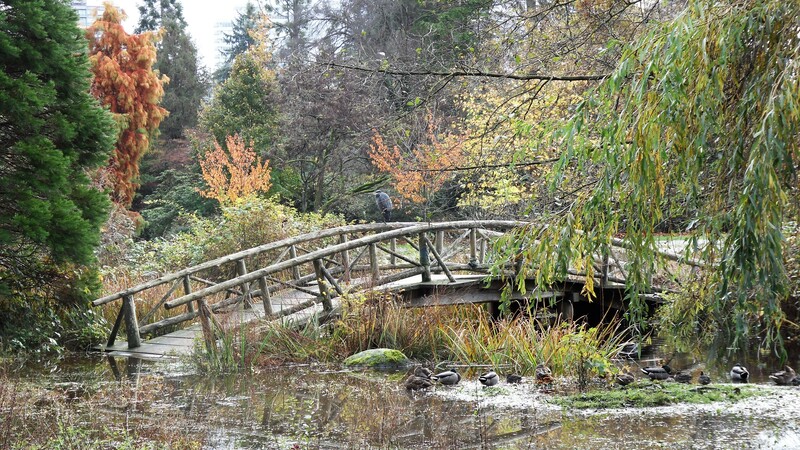 A Great Blue Heron captured on the wooden bridge near Lost Lagoon…this Monet-like setting the result of our early morning walks through Stanley Park (Vancouver, B.C.). 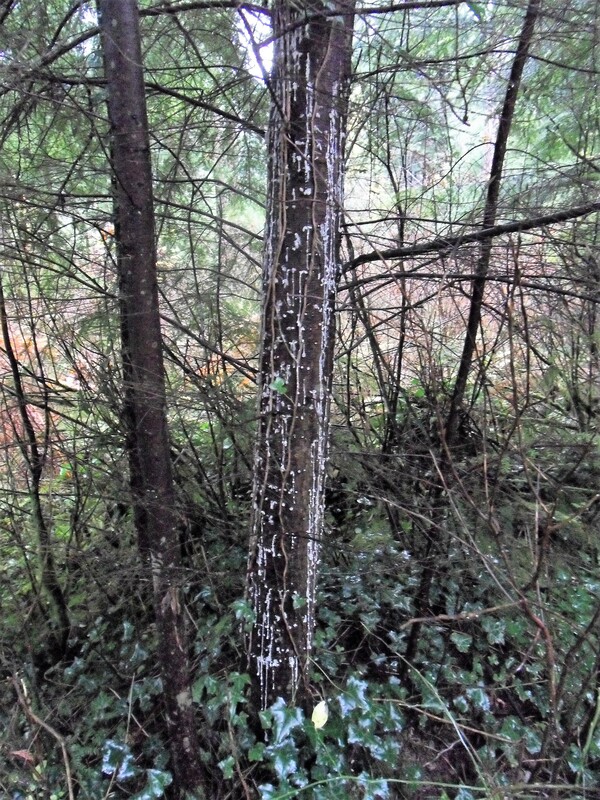 Sap glistening down this tree in Stanley Park (Vancouver, B.C.) reminds me of the winter light yet to come. Summer is over now, a few weeks after I wrote this post my father passed away and a good friend moved back home to Australia…the warm autumn days since have soothed my heart and have started to stir the writer within me once again. There is a post waiting to be published but my world has gone sideways with the hospitalization of my 82 year old father 6 weeks ago…he was admitted with a very serious infection that started a cascade of life-threatening illnesses that have resulted in a frantic visit to the hospital to learn that he is now moving from the medical intervention/monitoring model to palliative care. There are no words to share at the moment…it’s time to take a pause from blogging to be by his side if I’m able and to ensure that he makes his way through this transition peacefully. Be good, Dad and take good care! The marine air that we were promised has come to blow the coastal smoke away, although there is still pewter coloured smoke weaving its way through concrete and organic structures alike. The sky is a milky blue, the sunlight filtered and because of our very dry summer, there is a scent of autumn in the air. Walking through our favourite trail after a tasty lunch at the Urban Forest Café, we’ve found ourselves once again sitting on a bench at Beaver Lake listening to the sound of the leaves talking as a lone raven takes to the sky. We have a perfect view of the float planes as they crest the stand of forest on their way to Coal Harbour to drop off passengers from points unknown. We all need places that are green, places far from the fray of everyday life where we can gather our thoughts, to read like the young Harry Potter look-alike we came upon on Cathedral trail as we made our way home – bare feet perched on a crumbling log, deep into mysterious pages, a fairy-tale image just waiting to be captured on my own pages. Apparently he reads here most afternoons, tucked off the main trail, and I think that’s magical. These are some of the fleeting summer moments I’m compelled to gather in spite of the rising red sun and a sense of foreboding as smoke continues to touch our world. 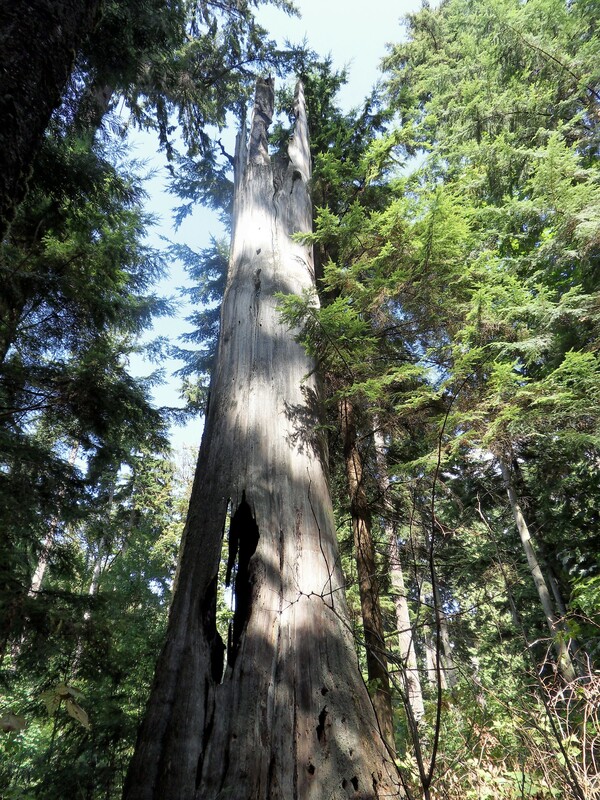 Today, the warm scent of cedar and wild mint is keeping us company on our summer trail after another picnic in the park. Blackberries are hard to find as autumn gently wanders in, so we settle on a log in a clearing to watch a preening Rufous-Sided Towhee sunning itself on a hill of moss as robins fly over our heads in search of berries, too. The rich, oxygenated air is a joy to breathe in after waking up to an eerily beautiful red sun, we are thankful to have big sky to look at without smoke to mar one of the last days of summer. As I make my way home I stop in at the Stanley Park Community Garden for a wander, it’s quiet now, bathed in colours of scarlet, copper and gold. White and currant coloured berries alongside tightly closed seed pods have replaced the pastel hues of spring – how sweet to see tiny sparrows perched inside a changing bush feasting on the insects found there. This is autumn asking us to awaken from the languorous days of summer…the season of foraging wasps and orb-spinners lighting the way before the rains come. 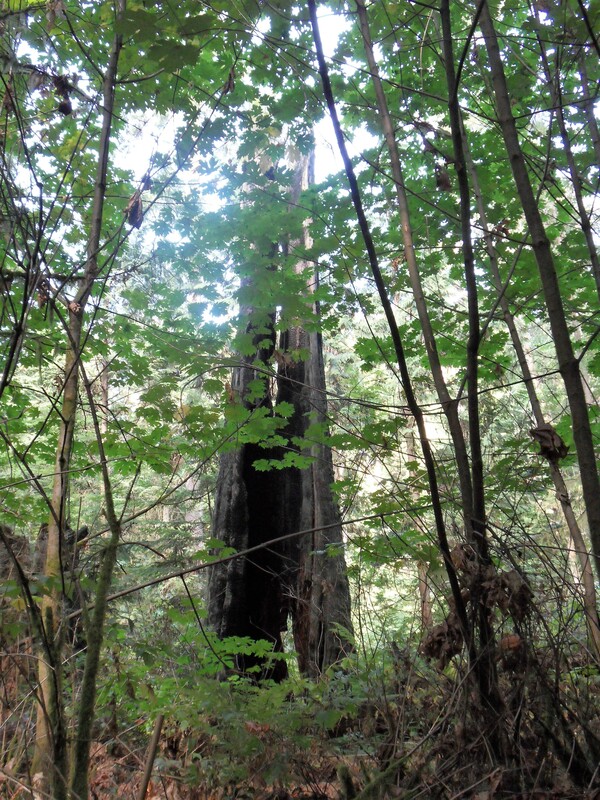 A hidden trail in Stanley Park (Vancouver, B.C. 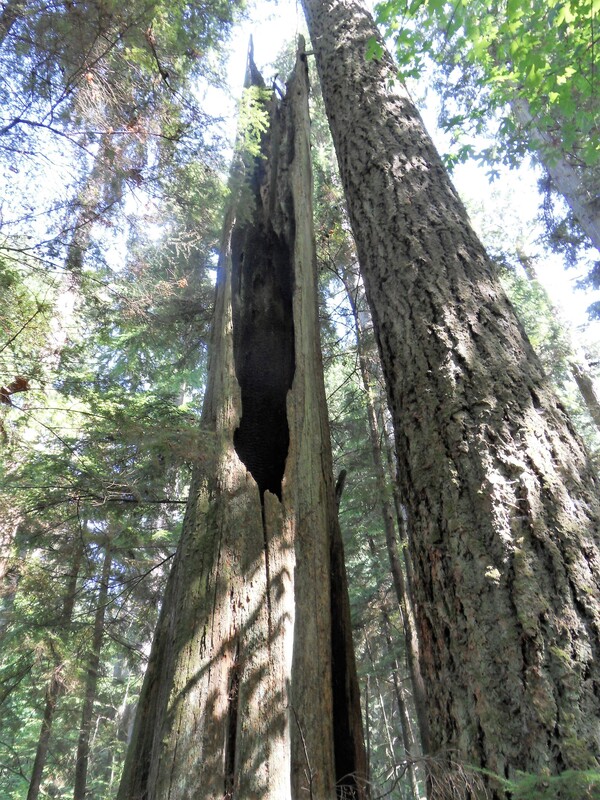 ), where majestic trees bear the marks of lightning strikes from many years ago. 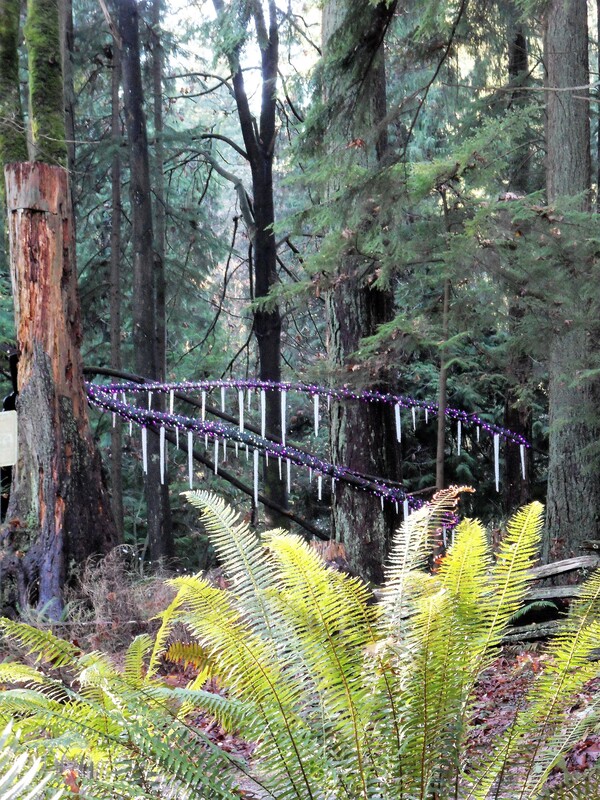 This beautiful capture on the same trail reminds us of scenes from “Lord of the Rings”! This post is dedicated to a beautiful artist in our neighbourhood who succumbed to the smoky skies, Judy Cameron (February 19, 1938 – August 19, 2018) – I still look for her selling her cards at the corner of Haro & Cardero. I found myself sitting on a still-green hill after another delicious fish and chips lunch outside, sitting near a young midnight-hued Common Raven. We noticed its majestic wing-span and large dark beak as it landed on the stone wall near our table at the concession at Lumberman’s Arch. I thought it was a large crow as it swooped down to capture a bit of someone’s leftover picnic. 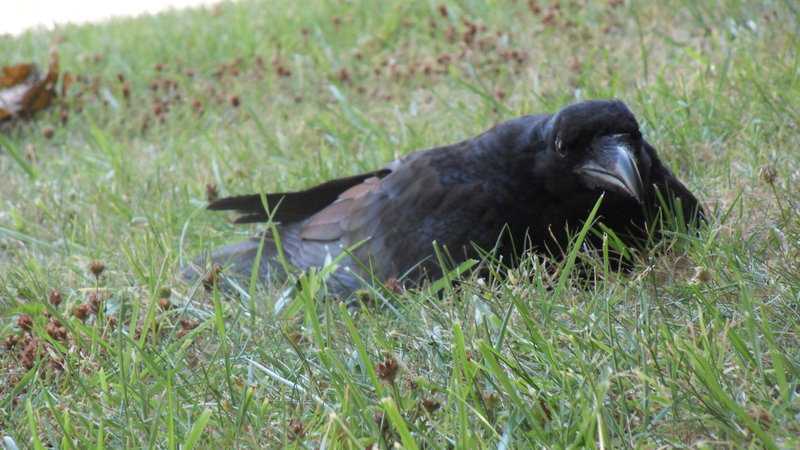 We watched as it flew into the shade (where we are now) to eat its prize – as we got up to leave we passed the raven resting upon the cool grass and stood curiously nearby as he didn’t fly away at our approach. 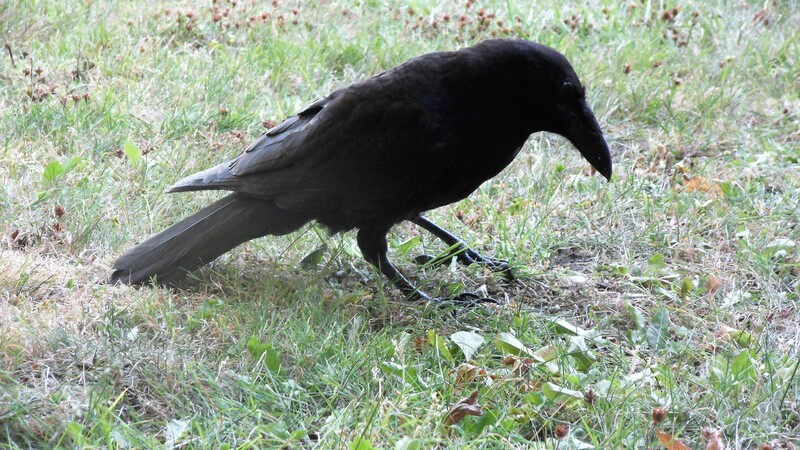 We noticed that the raven was favouring his left leg, so we stayed awhile to keep him company, sharing some of our farmer’s market cherries as we softly talked to him. He settled about 8 feet from us as he rested and the peaceful energy between us felt very sacred in this natural setting. Ravens are sky people and to be able to commune closely with this young one was an unexpected gift. It was hard to leave our new feathered friend but we were eager to walk the trails and keep cool on yet another hot day. 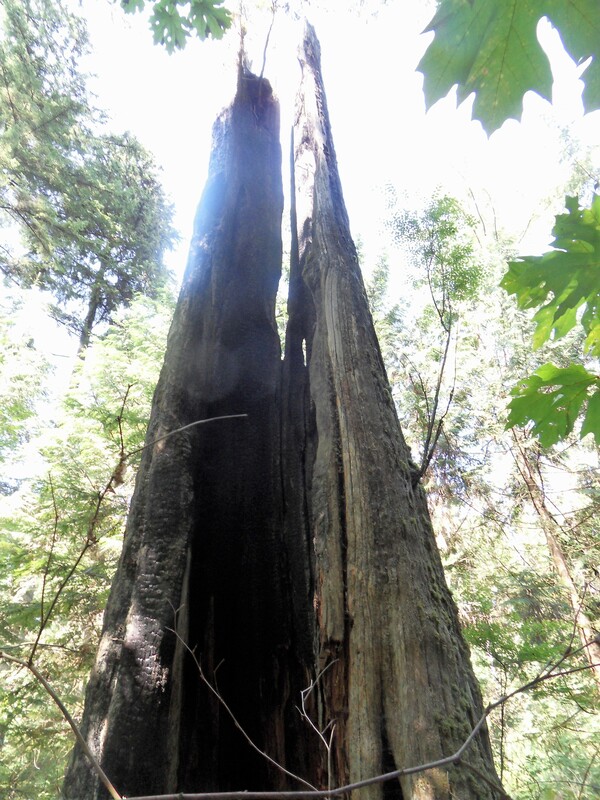 On our way, we found another hill to sit on at the base of a large cedar with a view of the strait to our right as we sipped our ice tea and took in the beautiful setting before heading deeper into the forest. 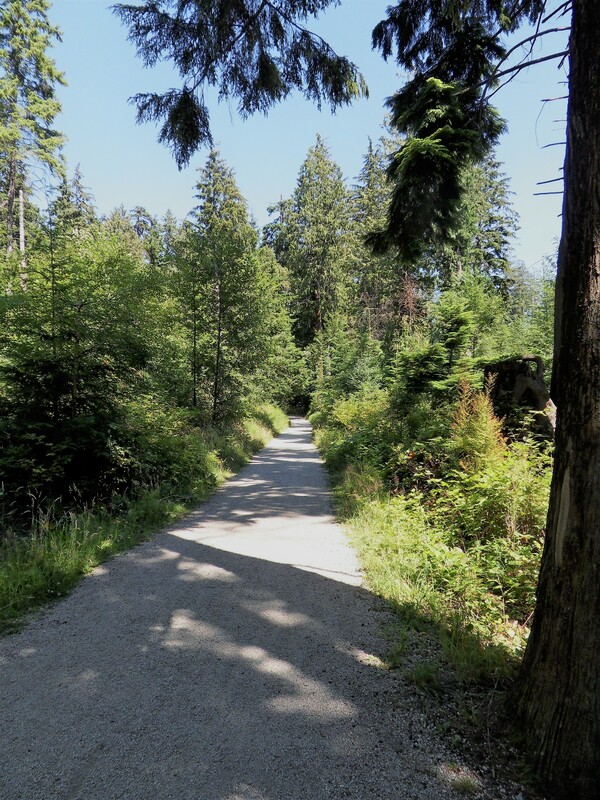 The trail we walk takes us through lush green down to Beaver Lake to hear the frog chorus and watch shimmering dragonflies hover near our shady bench. There is still generous foliage to admire among the delicate pinks and pure whites of the lilies crowding the surface of the brackish water still housing a beaver lodge that’s been here for years. Our new feathered friend, a young Common Raven sharing some sacred space with us near Lumberman’s Arch in Stanley Park (Vancouver, B.C.). Resting in the cool grass about 8 feet from us after indulging in farmer’s market cherries from the Okanagan! 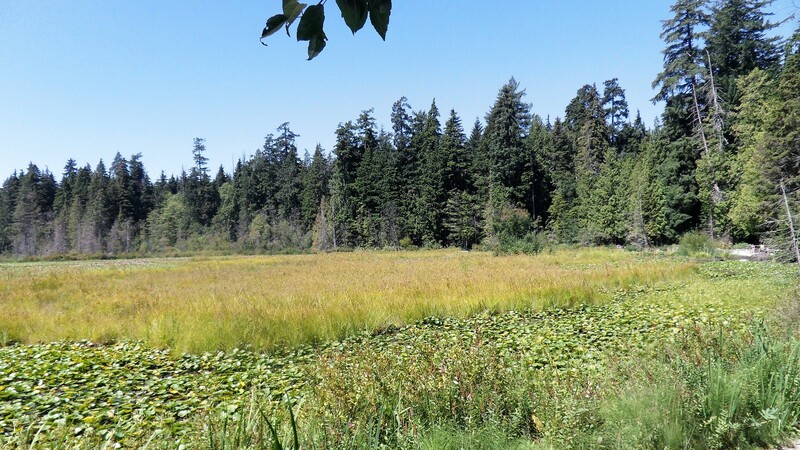 A high summer view of Beaver Lake from our shady bench in Stanley Park (Vancouver. B.C.). 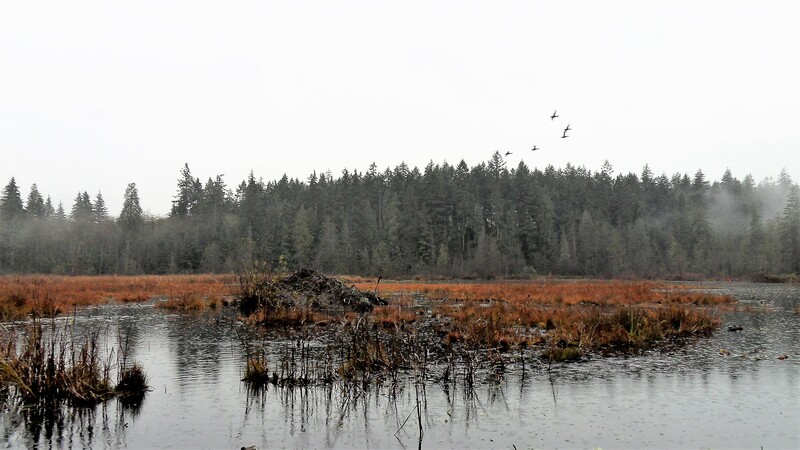 Beaver Lake is surrounded by beautiful trails and forest, it’s hard to believe that this beauty is just minutes from our West End apartment! As I sit here, polishing this post, that high summer day seems dream-like now as smoke from the almost 600 fires burning up country and up north blanket our city and beyond – in the past two days we have been blessed with fresher air, it’s a joy to leave our windows open to summer again. Hopefully an evening at the beach to hear cello playing beside the sound of ocean waves will be a balm for worried hearts. I walked down to English Bay with a Mason jar of ice tea to meet my Mom, eager to hear the cello player, a traveller who asked to join in for the sunset revel that we love so much. Each song played that night drew people closer to the sounds of the accordion, guitar, and drum as the red sun set behind the haze of smoke drifting in from Alberta, Saskatchewan, California and as far away as Alaska, Russia, and Greece, a reminder of how connected we really are! We woke this morning to the acrid scent of wood smoke permeating an apartment open to any breeze that might blow in during tropical nights reminiscent of Mexico. Each summer we hope for days redolent with soft, warm sunshine and enough rain to keep the grass cool and green. Instead we are left with thirsty leaves falling in late July and grass so dry, a careless cigarette tossed can start a brushfire. As I move from room to room up here in my aerie, my eyes anxiously scan the horizon looking for smoke, a sense of menace overshadowing what should be idyllic days. There are still good things to contemplate – sitting on my balcony in velvet darkness to watch the yearly fireworks display over the bay with a glass of dark red wine, delighting in the scent of magnolia in the air on walks through my neighbourhood and rosemary for rain (a beautiful Italian saying I came across recently!) as temperatures drop leaving behind the hottest July on record. 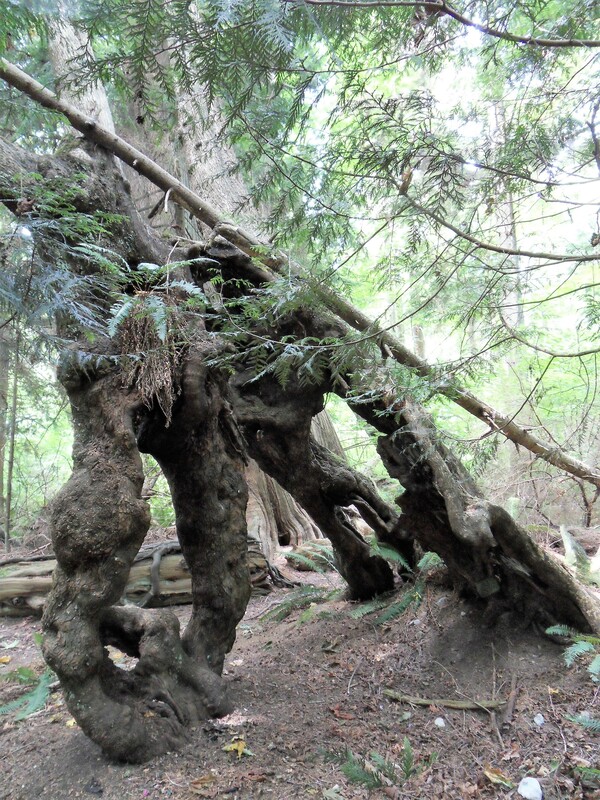 A beautiful shot of one of a trio of “forgotten beasts of the forest” near Lee’s trail in Stanley Park (Vancouver, B.C.). 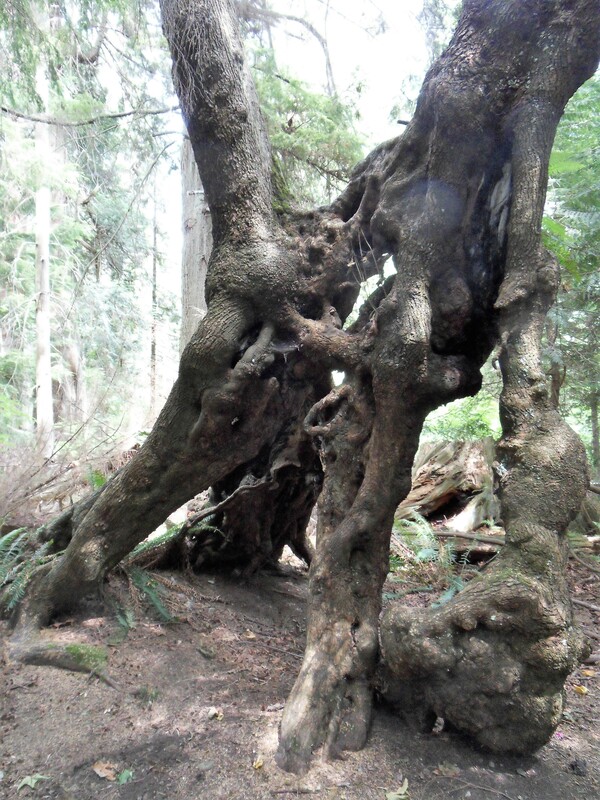 Another beautiful beast captured near Lee’s trail, one of our favourites, in Stanley Park (Vancouver, B.C.). 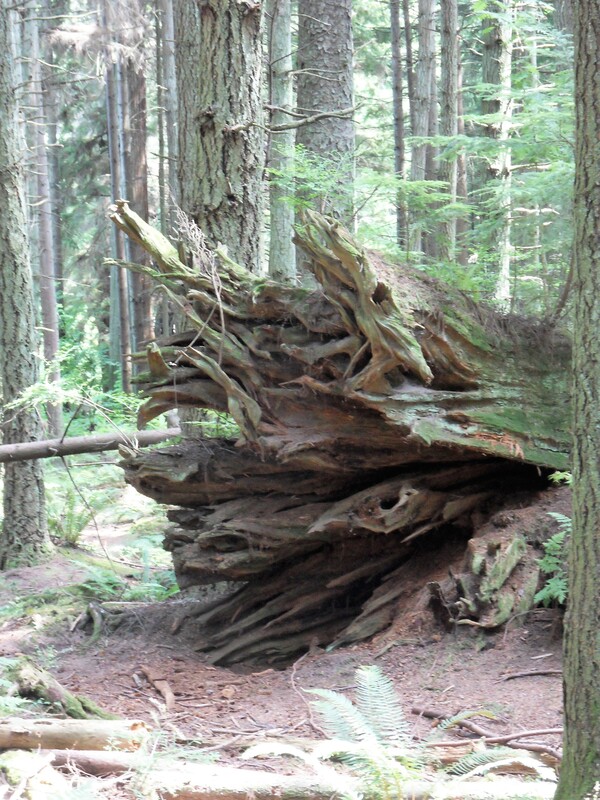 …and drumroll, here’s the third beautiful beast to be found near Lee’s trail in Stanley Park (Vancouver, B.C.). Early summer has brought changing skies, muggy air and the rumble of thunder. Looking in four directions yields a bank of dark clouds, stunning blue sky, a butter-like glow from the sun and soft rain leaving a shimmering iridescence behind. Gone for the moment are days held hostage by yet another heatwave and the threat of forest fires, but with this weather pattern starting to become our new normal, these moments will be a short reprieve from a new reality. With a blustery sea breeze, early morning and afternoons are the perfect time for cool walks in the park and lunches to be eaten outside. Today I’m patiently waiting to share a box of fish and chips with Terry at a favourite concession in the park. We’ve found a sunny spot where we can enjoy our Stash Lemon Meyer and Sunny Orange Ginger ice tea with our own tubs filled with a brightly coloured green salad (lovingly prepared with the generous produce from Saturday Farmer’s Market visits) – we try to picnic weekly during the fleeting months of summer, choosing the day based on the weather forecast. 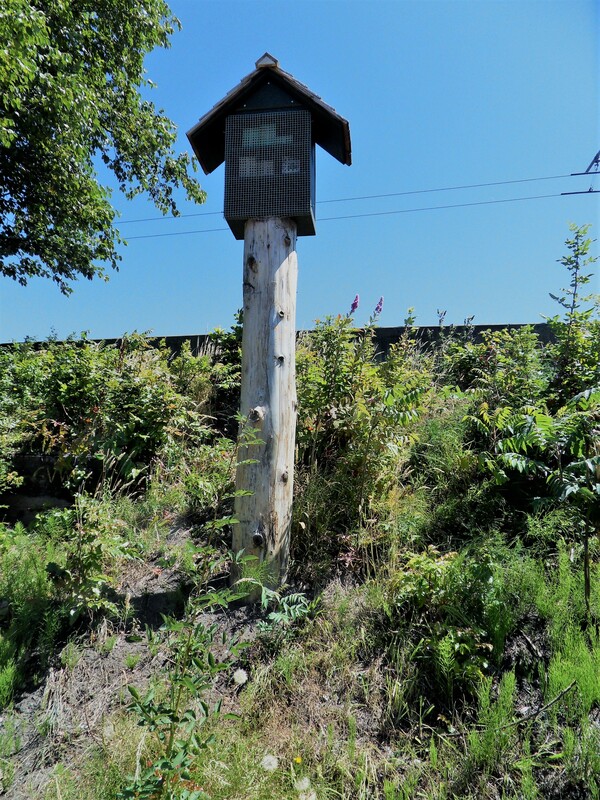 Afterwards, I couldn’t resist stopping by the Pollinator’s Paradise, a beautiful pagoda structure located across from Lost Lagoon housing native Blue Orchard Mason Bees (Osmia lignaria). The waters of the lagoon are dark brown with sparkling waves bumping against the lush edges of the gravel path. There is still some ice tea to sip as I sit on the low stone wall watching swallows skim over the water and breathe in the subtle scent of salty summer air. There are exotically attired butterflies and dragonflies sharing this space and the many languages floating on the air makes me feel far away from the domestic life waiting for me behind closed doors. Wanting to linger on this glorious of summer days, I wandered over to the Stanley Park Nature House to admire the new landscaping where I spied a small green turtle sunning itself on an exposed rock and upon climbing some stone steps, noticing some guerrilla yarn bombing in vibrant shades of lemon yellow, pale blue, slate gray with magenta and emerald green wrapped artfully around some black wrought iron fencing. A shady bench with a view of Grouse Mountain in the distance and the last of the ice tea are perfect footnotes to a spontaneous lunch out in the wild. A walk down by the ocean on my way to buy coffee for my Dad’s cupboard this week had me yearning to join the swimmers bobbing gently among the undulating waves. The colour of the water, a rare sight, replacing the typical Pacific cobalt blue were tropical shades of dusky green and azure creating an otherworldly moment, making one feel that time travel exists if we are willing to go for the ride. But in between this summer magic, niggling bites of reality leak in…blood tests not ordered in six years, my family doctor suggesting I don’t look when I take my requisition to the lab in preparation for my first yearly check-up after being cancer free for 5 years and the harrowing days of waiting for another shoe to drop when magic left my world briefly all those years ago…what a relief to finally see the results and magic’s return, I’m still here, happily writing down my world, in wonder of what might be around the corner waiting to find itself on my pages. A beautiful shot of the Pollinator’s Paradise pagoda across from Lost Lagoon in Stanley Park (Vancouver, B.C.). 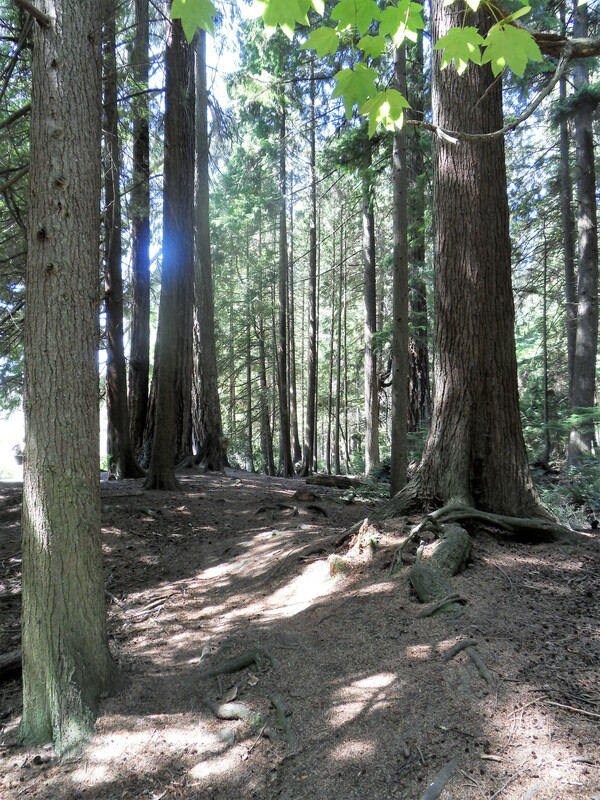 Mid-summer finds us seeking the shade-dappled trails of Stanley Park (Vancouver, B.C.). This post is dedicated to my Mom who shares her Farmer’s Market bounty with us each week and surprises us with tasty soups as well!